The Bulgarian Land Forces (Bulgarian: Сухопътни войски на България) are the ground warfare branch of the Bulgarian Armed Forces. 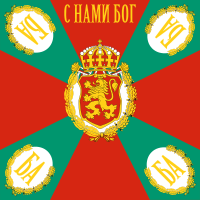 The Land Forces were established in 1878, when they were composed of anti-Ottoman militia (opalchentsi) and were the only branch of the Bulgarian military. The Land Forces are administered by the Ministry of Defence, previously known as the Ministry of War during the Kingdom of Bulgaria. The Land Forces were made up of conscripts throughout most of Bulgaria's history. During World War I, it fielded more than one million troops out of Bulgaria's total population of around four million. Two-year conscription was obligatory during Communism (1946–1990), but its term was reduced in the 1990s. Conscription for all branches was terminated in 2008; since then, the Land Forces are a volunteer force. Bulgarian Land Forces troops are deployed on peacekeeping missions in Afghanistan, Bosnia and Herzegovina and Kosovo. Since 2004, the Land Forces are in a process of continued restructuring. Under the most recent reform, brigades were reduced to regiments, while several garrisons and brigades were disbanded. The Land Forces are functionally divided into 'Active" and "Reserve Forces". Their main functions include deterrence, defense, peace support and crisis management, humanitarian and rescue missions, as well as social functions within Bulgarian society. The Active Forces mainly have peacekeeping and defensive duties, and are further divided into Deployment Forces, Immediate Reaction, and Main Defense Forces. The Reserve Forces consists of Enhancement Forces, Territorial Defense Forces, and Training Grounds. They deal with planning and reservist preparation, armaments and equipment storage, training of formations for active forces rotation or increase in personnel. During peacetime the Land Forces maintain permanent combat and mobilization readiness. They become part of multinational military formations in compliance with international treaties Bulgaria is a Party of, participate in the preparation of the population, the national economy and the maintenance of wartime reserves and the infrastructure of the country for defense. In times of crisis the Land Forces' main tasks relate to participation in operations countering terrorist activities and defense of strategic facilities (such as nuclear power plants and major industrial facilities), assisting the security forces in preventing proliferation of weapons of mass destruction, illegal armaments traffic and international terrorism. In case of low- and medium-intensity military conflict the Active Forces that are part of the Land Forces participate in carrying out the initial tasks for the defense of the territorial integrity and sovereignty of the country. In case of a military conflict of high intensity the Land Forces, together with the Air Force and the Navy, form the defense group of the Bulgarian Military aiming at countering aggression and protection of the territorial integrity and sovereignty of the country. On 22 July 1878 (10 July O.S.) a total of 12 battalions of opalchentsi who participated in the Liberation war, formed the Bulgarian armed forces. According to the Tarnovo Constitution, all men between 21 and 40 years of age were eligible for military service. In 1883 the military was reorganized in four infantry brigades (in Sofia, Pleven, Ruse and Shumen) and one cavalry brigade. The Bulgarian unification of 1885 made Bulgaria the largest Balkan state in terms of territory, which immediately sparked dissent in Serbia and Greece, which demanded territorial compensations. While the agitation of the Greek side calmed down, Serbia - backed by Austria-Hungary - launched a military campaign against Bulgaria. The Serbs, expecting a quick end to the war, suffered losses and were pushed back by Bulgarian troops who did not have higher-ranking officers than captains at the time. Owing to its militaristic policy at the time, Bulgaria was labelled as a "Balkan Prussia". In the early 1900s instability in the Balkans continued, as the collapse of the Ottoman Empire was progressing. After an anti-Ottoman rebellion in Macedonia and an Ottoman defeat in the Italo-Turkish War, Bulgaria, Greece, Serbia and Montenegro settled their differences and formed a coalition against the Ottoman Empire, known as the Balkan League. In late September 1912, both the League and the Ottoman Empire mobilised their armies. Montenegro was the first to declare war, on 25 September. The other three states, after issuing an impossible ultimatum to the Sublime Porte on 13 October, declared war on 17 October. Bulgaria was militarily the most powerful of the four states, with a large, well-trained and well-equipped army. The peacetime force of 60,000 men was expanded during the war to 370,000 (more than half of the League's total of 700,000 troops), with almost 600,000 men mobilised in total, out of a population of 4,300,000. The field army counted for 9 infantry divisions, 1 cavalry division and 1,116 artillery units. Bulgarian troops marked a decisive victory at Kirk Kilisse and captured Adrianople after a prolonged siege. A British war correspondent of the era compared the determination of Bulgarian troops to kill their enemy with that of the Japanese and the Gurkhas. The Second Balkan War began shortly after the end of the first one. A dispute between Bulgaria, Serbia and Greece over the division of Macedonia prompted the Bulgarian leadership to attack its neighbours. Bulgarian troops were still exhausted by the first war, and the majority of Bulgaria's forces were deployed along the Ottoman border. During the war, Bulgaria fought against all its neighbours, including Romania, which did not participate in the first war. The 500,000-man Bulgarian army faced a total of 1,250,000 enemy troops from all sides. Supply and coordination problems and the overwhelming numbers of the attackers brought about an end to the war in less than two months. The outcome of the Balkan Wars sparked a very strong revanchist sentiment among Bulgarians. In 1915 Germany promised to restore the boundaries according to the Treaty of San Stefano and Bulgaria, which had the largest army in the Balkans, declared war on Serbia in October the same year. In the First World War Bulgaria decisively asserted its military capabilities. The second Battle of Doiran, with general Vladimir Vazov as commander, inflicted a heavy blow on the numerically superior British army, which suffered 12,000 casualties against 2,000 from the opposite side. One year later, during the third battle of Doiran, the United Kingdom, supported by Greece, once again suffered a humiliating defeat, losing 3,155 men against just about 500 for the Bulgarian side. The reputation of the French army also suffered badly. The Battle of the Red Wall was marked with the total defeat of the French forces, with 5,700 out of 6,000 men killed. The 261 Frenchmen who survived were captured by Bulgarian soldiers. Out of a 4.5 million population, Bulgaria fielded 1,200,000 people in its army. Even this vast expansion of the military could not save Bulgaria from the imminent defeat of its patron Germany. The Allied breakthrough at Dobro Pole and the subsequent soldier mutiny at Vladaya completely disrupted the war effort in 1918. Bulgaria capitulated soon after these events. Bulgarian casualties amounted to 412,000, along 253,000 refugees from the lost territories. During the Interbellum the Bulgarian military was not allowed to have active combat aircraft or naval vessels, and the Land Forces were reduced to about 20,000 men in peacetime. In the early 1920s army officers participated in repressions during the Tsankov regime as part of paramilitary groups known as shpitskomandi. In 1923 the Army, along with shpitskomandi and Internal Macedonian Revolutionary Organization (IMRO) militia, violently suppressed the leftist September Uprising. Two years later Bulgarian troops stopped a short-lived Greek invasion of southwestern Bulgaria, known as the War of the Stray Dog. By the mid-1930s, the Army had begun an expansion in violation of the Treaty of Neuilly-sur-Seine, following the rearmament pattern of Nazi Germany. During this period, the Bulgarian government procured combat aircraft from Germany and France, and light tanks from Italy. During World War II, Bulgarian troops did not participate in the invasion of Yugoslavia and Greece, but occupied parts of northern Greece and Yugoslav Macedonia after they were conquered by Germany. The Army was the main tool in imposing a policy of relocation, and expulsion of the local Greek population in the occupied areas. By late 1941, more than 100,000 Greeks had been expelled from the Bulgarian occupation zone. Increasing attacks by partisans in the latter years of the occupation resulted in a number of executions and wholesale slaughter of civilians in reprisal. In 1944, a Red Army-backed left-wing coup d'état overthrew the pro-German government and installed a Fatherland Front government. All active Bulgarian troops were incorporated into the Soviet 3rd Ukrainian Front and began to fight their former German allies. The Bulgarian 1st Army took part in the Yugoslav campaign. During Operation Frühlingserwachen, it fielded 101,000 men. At the end of March 1945, 1st Army led the Nagykanizsa–Körmend Offensive. After defeating the German units, the Bulgarians reached the Austrian Alps and on 13 May they met the British 8th Army near Klagenfurt. The Vienna Offensive was one of the final operations with Bulgarian participation during World War II. By the end of the 1940s, the Land Forces were steadily reorganising along the Soviet model, in parallel with the economic and political changes in the country. In 1955, all branches of the Bulgarian military numbered 275,000 men. The Land Forces operated 800 tanks and had a formidable artillery corps. By 1987, the Land Forces were organised in eight motor rifle divisions and five tank brigades; after 1987 the motor rifle divisions were reorganised into brigades as well. At that time all ground units operated 2,550 tanks. There were no Soviet forces present in the country. 101st Alpine Regiment, Smolyan - the 68th Special Forces Brigade was transferred from the Land Forces to the Chief of Defence on February 1, 2017. 101st Mountain Battalion detached from it and retained its place within the Land Forces to become their special operations unit with an upgrade to regiment. Land Forces Training Range "Koren"
The 61st Mechanised Brigade is earmarked for deployment with the Greek NATO Rapid Deployment Corps for exercises, emergencies and for actions along NATO lines. For that reason the corps has a Bulgarian Major-General as a deputy commander. In addition to its training tasks the Specialists Training Center, Sliven, which is the former 13th Tank Brigade, is the storage facility of the operational reserve of 160 T-72M1 tanks and many other armoured vehicles. The plan for the mechanised brigades is for each of them to have three battalion battlegroups. Although the first three battalion battlegroups are already formed the MoD disclosed very little information about their actual structure. What little is known is, that each of them will have three rifle companies and integral fire and engineer support (including EOD disposal). In addition to that, according to the modular principal of actions the structure is optimised to easily integrate additional supporting units tailored to the actual mission, such as tanks, self-propelled artillery, self-propelled missile air defence units, special forces, heavy engineering, CIMIC etc. Contingency plans envision, that one of the brigades will be fully ready to deploy entirely for operations overseas, while the other, alongside the new Mountain Infantry Regiment, assumes the armed forces' paramount mission of defending the territorial integrity of the country. ^ "Serbo-Bulgarian War". Encyclopædia Britannica. Retrieved 6 July 2012. ^ Dillon, Emile Joseph (February 1920) . "XV". The Inside Story of the Peace Conference. Harper. ISBN 978-3-8424-7594-6. Retrieved 20 December 2011. The territorial changes which the Prussia of the Balkans was condemned to undergo are neither very considerable nor unjust. ^ "Balkan Wars". Encyclopædia Britannica. Retrieved 7 July 2012. ^ David Johnson (August 1997). "Splendid Fellows, Splendidly Led". Military History magazine (vol. 14 issue 3). Archived from the original on 22 August 2001. Retrieved 7 July 2012. ^ Filipov, I. (1941). Войната между България и другите балкански държави през 1913 г. 1. Sofia: Държавна печатница. pp. 163, 164, 171. ^ Broadberry, Stephen; Klein, Alexander (8 February 2008). "Aggregate and Per Capita GDP in Europe, 1870–2000: Continental, Regional and National Data with Changing Boundaries" (PDF). Department of Economics at the University of Warwick, Coventry. p. 18. Archived from the original (PDF) on 22 June 2012. Retrieved 24 May 2012. ^ Tucker, Spencer C; Wood, Laura (1996). The European Powers in the First World War: An Encyclopedia. Taylor & Francis. p. 173. ISBN 0815303998. ^ Mintchev, Vesselin (October 1999). "External Migration in Bulgaria". South-East Europe Review (3/99): 124. Retrieved 20 December 2011. ^ Shrader, Charles R (1999). The Withered Vine: Logistics and the Communist Insurgency in Greece 1945–1949. Greenwood Publishing Group. p. 19. ISBN 0-275-96544-9. ^ Jukes, Geoffrey (2002). The Second World War (5): The Eastern Front 1941–1945. Osprey Publishing. p. 68. ISBN 1-84176-391-8. ^ Chatzēvasileiou, Euanthēs (2006). Greece and the Cold War: Frontline State, 1952–1967. Routledge. pp. 69–70. ISBN 0-415-39664-6. ^ Goldman, Emily (2003). The Diffusion of Military Technology and Ideas. Stanford University Press. pp. 124, 126, 127, 128. ISBN 0-8047-4535-8. ^ "Командирът на Сухопътни войски ген. Андрей Боцев пред „Труд": Няма справедливост в проектите за модернизация на армията". Труд (in Bulgarian). Retrieved 10 February 2018. ^ Dariknews. "Два батальона се преподчиниха на Единния център за начална подготовка в Плевен - Плевен - DarikNews.bg". dariknews.bg (in Bulgarian). Retrieved 10 February 2018. ^ БНТ2-Пловдив. "68-а бригада „Специални сили" в Пловдив вече е самостоятелна бойна единица". Новини БНТ. Retrieved 11 April 2018. ^ Dariknews. "101-ви Алпийски батальон в Смолян ще бъде трансформиран в полк - Пловдив - DarikNews.bg". dariknews.bg. Retrieved 11 April 2018. Hall, Richard C. (2000). The Balkan Wars, 1912–1913: Prelude to the First World War. Routledge. ISBN 0-415-22946-4. Knopp, Guido (2009). Die Wehrmacht - Eine Bilanz (in German). Goldmann. ISBN 978-3-442-15561-3. Mazower, Mark (1995). Inside Hitler's Greece: The Experience of Occupation, 1941–44. Yale University Press. ISBN 0-300-08923-6. Miller, Marshall Lee (1975). Bulgaria during the Second World War. Stanford University Press. ISBN 978-0-8047-0870-8. "Structure and functions of Bulgarian land forces". Ministry of Defence of Bulgaria. Archived from the original on 28 September 2007.